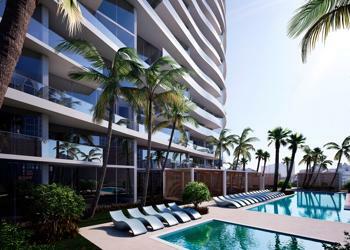 Designed by architect Luis Revuelta and the Verzasca Group, Aurora offers 61 boutique two- and three-bedroom homes, as well as amenity deck lanai homes and penthouse residences in the most vibrant strip of Sunny Isles Beach. Each home has private elevator entry, inviting 10’ ceilings, sun-washed floor-to-ceiling windows, and private curved terraces that capture the finest views and features of the Sunny Isles atmosphere. 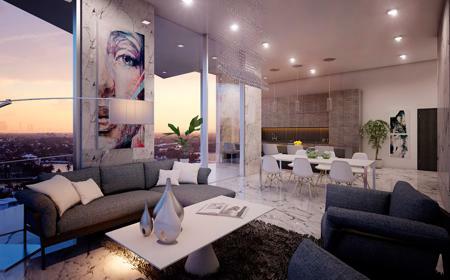 With designs by Antrobus + Ramirez, residents enjoy a collection of elegant finish selections and creative aesthetics alongside an unrivaled array of resort-like amenities. Surrounded by lush landscapes by Lewis & Nielson Design, residents enjoy a private sundeck and cabana lounges, a half-Olympic length pool, and outdoor yoga area with the ocean only a 5-minute walk away. With the addition of a world-class fitness center, kid’s zone and family area, a Hammam, as well as beach attendant and concierge services, residents at Aurora receive the best of Sunny Isles within their own private serene getaway. Sunny Isles Beach is one of the world’s most sought-after destinations, defined by its alluring coastlines and vibrant atmosphere. Famous for its year-round tropical weather and pristine beaches, the island divides the Atlantic Ocean and intracoastal waterways, and harbors an exciting lifestyle. With the open-air shops and designer brand stores of Bal Harbour and the Aventura Mall only a short drive away, Aurora offers residents full access to an array of shopping, as well as the dining, arts, entertainment, and culture of Greater Miami. Home to Sunny Isles Beach’s most unique open-concept layouts, Aurora offers 61 boutique two- and three-bedroom homes, as well as amenity deck lanai homes and penthouse residences with private rooftop terraces. Residences include 10’ ceilings, private curved terraces, floor-to-ceiling windows, and private elevator entry, while Penthouses additionally include ocean views. Designed by Antrobus + Ramirez, Aurora’s homes are curated with elegant finish collections and creative aesthetics. 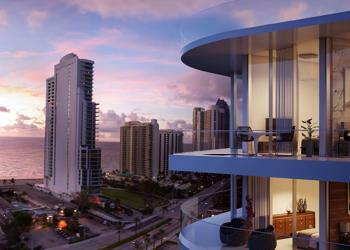 Each residence includes world-class Wolf, Sub-Zero, Bosch, and ASKO Energy Star kitchen and home appliances.